1. Take control of the situation. Not being in the driver’s seat can contribute to motion sickness when you’re traveling by car. 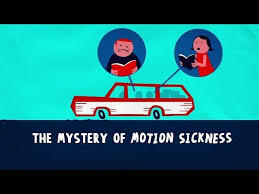 The driver of a car is less prone to motion sickness than a passenger, presumably because the driver’s brain is using its motor commands to control the car and can predict the motion. Putting yourself behind the wheel will keep the queasiness at bay. If you must ride as a passenger, try sitting in the front seat, which confers a sense of greater control than riding in the back. If you get stuck in the back seat, try conversation and distraction to alleviate the anxiety of not being in control of the situation. Open a vent or source of fresh air if possible and avoid reading. Yoga seemed to have answers for every health issue. Yoga is one of the oldest holistic health care systems, not just because of its fundamental healing approach, but also because of its many benefits for physical, mental and spiritual well being. Yoga asana Postures help to improve stability, body balance, fight vertigo, improve digestion; treat nausea and dizziness help people with chronic motion sickness. Watch your consumption of foods, drinks, and alcohol before and during travel. Avoid excessive alcohol, smoking, and foods or liquids that “do not agree with you” or make you feel unusually full. Foods with strong odors, heavy, spicy, or fat-rich foods may worsen symptoms of nausea or motion sickness in some people. Try to choose a seat where you will experience the least motion. The middle of an airplane over the wing is the calmest area of an airplane. On a ship, those in lower level cabins near the center of a ship generally experience less motion than passengers in higher or outer cabins. Isolate yourself from others who may be suffering from motion sickness. Hearing others talk about motion sickness or seeing others becoming ill can sometimes make you feel ill yourself. 4. Equalize your sensory cues. If you’re getting seasick, lie down to help your sensory systems become congruent. On a train, sit in a front-facing seat so your eyes relay the same movement cues as the vestibules of your inner ear. Also, when traveling by car or boat, it can sometimes help to keep your gaze fixed on the horizon or on a fixed point. The more you enhance sensory congruence, the less likely you are to get queasy. You actually can talk yourself out of motion sickness. A study found that “verbal placebos”—simply telling sailors they won’t get seasick—have been effective in preventing seasickness. Set your own expectations before traveling by saying aloud, “I’m not going to get carsick this time,” or using other affirmative self-talk. Learning breathing techniques by using biofeedback can help in this endeavor.